Mechanistic force models allow an estimation of the force components in cutting technology. This is essential for an accurate simulation of the force, an analysis of the tool load, or a model-based predictive force control. The model coefficients do not only depend on the material and the tool but also on the engagement condition. This requires an online identification of those coefficients. 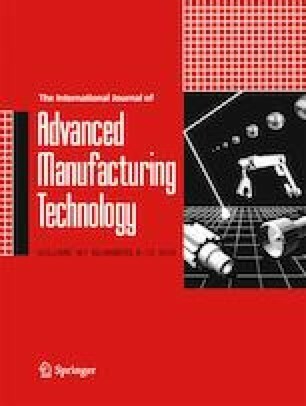 To determine those coefficients, this paper uses curve fitting based on the instantaneous uncut chip thickness, a method that has only recently gained momentum in milling. This work applies this technique to the well-established, nonlinear Kienzle force model. The paper reviews a broad range of nonlinear, derivative-free optimization algorithms for this least-squares curve-fitting problem evaluating accuracy and runtime. The evaluation is conducted on 121experiments with distinct process conditions resulting in a statistically verified conclusion. The results indicate that in spite of a heterogeneous optimization space, local constrained algorithms are most suited for model identification. The authors would like to thank the German Research Foundation (DFG) for the support of the depicted research within the Cluster of Excellence Integrative Production Technology for High-Wage Countries. Furthermore, we would like to acknowledge the financial support of the Kopernikus-project “SynErgie”by the Federal Ministry of Education and Research (BMBF). Selected preliminary results of this work were presented at the 14th International Conference on High Speed Machining 2018, San Sebastian, Spain.